Are You a Vinyl Buyer? More Importantly, Are You a Vinyl Listener? 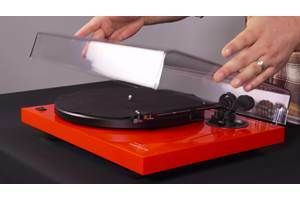 Articles & Videos: Home / Home Audio / Turntables & Accessories / Turntables / Are you a vinyl listener, or just a vinyl buyer? If there’s one thing that’s true about Crutchfield, it’s that we’re seriously into audio. We’re so serious, it’s in our motto, which lives right below our logo at the top of this page. Vinyl’s “revival” started about ten years ago. A couple of recent surveys have brought some interesting trends to light. While we could spend pages and pages discussing the sound of vinyl versus other media formats here, we’re not going to do that. Many of us grew up listening to vinyl and we believe that a properly cared-for record played through the right gear can sound just grand. But we also recognize that vinyl can be a real pain — it’s somewhat delicate, gets dirty easily, and requires several pieces of precision equipment (needle, cartridge, tonearm, belt, motor, platter, etc.) working together to make it sound right. It also takes up a lot more real estate than every other physical format. These things prompt the question: why are people still buying vinyl? And if so, are they actually listening to it? IMC Unlimited, a British market research agency, conducted a survey in March 2016 to determine who is buying new records and how they are listening to their purchases. They found that 48% of people who bought vinyl in the past month claimed they had not played their records yet. And that 7% of respondents didn’t even own a turntable. The age breakdown of vinyl buyers tilted surprisingly young, with nearly half of respondents (49%) aged between 18 and 34. What does this survey seem to indicate about vinyl buyers in general? For one, they still like to listen through a digital device, whether to their favorite streaming service or downloaded files from a code which often accompanies their new vinyl purchase. They also use their vinyl purchase as a tangible totem of their fandom for an artist. There’s also the nostalgia factor for something they missed the first few times around, as many of these buyers were brought up in the CD era beginning in the early 1990s. And vinyl is inherently more “collectible” than other formats. Limited edition color variants like the one seen here turn some records into instant collector's items. Could vinyl eclipse digital downloads? Vinyl sales have been on the increase for the past decade. They’ve really surged in the past two years, driven in part by the ability to preview tracks through streaming services such as Spotify, Apple Music, and YouTube. While the sales of CDs seem to have stabilized after nearly 15 years of precipitous year-over-year decreases, the newest victim of streaming services seems to be download sales. The Entertainment Retailers Associations (ERA) reports that in the UK more money was spent on new vinyl sales than digital album downloads for the last week of November 2016. For the past few years digital download sales were about even with CD sales in most areas, with vinyl making up less than 10% of the total market, so it remains to be seen if this is indicative of a trend or a blip. 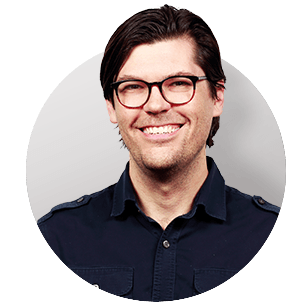 However, as consumer music dollars shift toward streaming services, it stands to reason that pricey records could someday compete with less expensive downloads for total dollars spent with far fewer units sold. As vinyl production has ramped up, it’s even easier to find records while shopping — not just online, but in unexpected places like bookstores, department stores, and lifestyle retailers targeted toward the younger demographic. If you're a vinyl buyer, leave a comment about your preferred method of listening, even if it means your records spend most of their time on the shelf instead of the turntable. Also let us know if you prefer your records used, new, or a mixture of both. And if you are a vinyl aficionado who still plays their records, feel free to share your setup, including turntable, cartridge, preamp, amp/receiver, and speakers. I'm 54 and a product of the 80's but was lucky enough to be influenced by the best eras of music, the 60's, 70's, and 80's. With that being said, my musical preferences are, in order, Rock -which includes Soft Rock, Hard Rock, and Metal, some Jazz, Easy Listening, and Classical. Back in the day, I used to transfer LP's -some mine & some borrowed- to tape on my aunt's stereo because they had money and had a decent set-up to do so. I have a small collection and just recently purchased a new turntable. My set-up consists of an Audio Technica AT-LP120 with a new AT440MLB cartridge connected to my existing Onkyo TS-SR804 home theater receiver-amp, with a 5.1 Aperion Audio speaker system (don't remember the model #). Since re-connecting to listening to music through LP's, I've discovered that there's a lot to learn about setting a system up. It's not simply just plug it in and start spinning. I mean, you could, but to get the best sound, there are some technical things you need to do (Google "setting up a turntable"). And then there's the removing the disk from the sleeve, cleaning it, setting the stylus on the disk, turning the disk over, and putting it back in the sleeve, sandwiching the most important part -the listening. But it's all worth it. Been collecting and playing vinyl records since the 70s. (I'm 61 y/o) Started with a Pioneer system. Had an 8 track in my first car, a tape cassette player at home. Being a gadget guy, got into CDs and streaming. But I never gave up my first love, Vinyl. These days I use an AT LP120 with an Ortofon Red cartridge, an older Sony tuner/amp with a phono connection, and a pair of fantastic Klipsch Reference speakers or AT M50X headphones. I was very happy when new pressings started coming out and I have added to my original collection. I have an eclectic collection, from Sinatra to AC/DC. From Alabama to Zevon. I've more recently discovered Joe Bonamassa and my new favorite, BlackBerry smoke. I still use digital when I travel, but when I really want to experience the music, I relax with an album, liner notes in hand. Vinyl lovers, enjoy and listen often. I was 10 in 1977, one of the best years for music. Since we lived in a small town 60 miles from Cincinnati, OH. it was an event just to get to the mall or a record store in the city. So when I or one of my friends got a new album, and since I had the best stereo set-up between us, Marantz TT, Teac, 3-head, cassette deck, Sansui receiver and a pair of Heathkit speakers. I would make a cassette tape, TDK-SA90, of whichever record was bought, I could easily get two albums on one tape. That way I had a fairly good copy to play in my car, anyone else who brought me a tape I would make them a copy also, I had one friend in HS that preferred the Maxxell XL-II tapes but I would still make him a copy as long as he bought the tape. Lol. Another friend wasn't into the vinyl but he wanted the music, and he had the means, so he bought quite a few albums, I would supply the tape and he just let me keep the records for my collection. I had around 100 albums when I graduated in 1985. I was also an early adopter of CD's I bought Deep Purple Perfect Strangers, in 84 even before I got a Pioneer CD player that year for Christmas. The next year my apartment was broken into and I lost all my vinyl, CD's and equipment, I replaced the gear but the music, some original albums with all the posters etc. was almost impossible to recover and music I had recorded, radio stations used to play whole albums, and King Biscuit Flower Hour shows were gone forever. The new 180g records sound very good today. Brian Davis from Cincinnati oh. I listen to vinyl because I like to own music, rather than rent it. I love vinyl! I also love CD's. Recently started listening to my vinyl collection on my new Klipsch home theater system. I individually selected the components, paired them to my Onkyo 7.2 receiver and was stunned at the quality of sound! 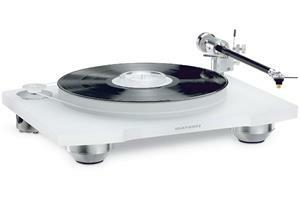 I ended up buying a Denon automatic turntable, an Audio-Technica cartridge (breathtaking) and started buying new discs. After getting over the sticker shock on the price of records, I was enthralled by the incredible warmth and clarity (and noise-free) sound. My 60 year old records are quiet and enveloping. I have my onkyo set up with 2 Klipsch 12-inch powered subwoofers, the large bookshelf speakers for the ends, a large center and four surrounds. The vinyl recordings are amazing and I spend at least an hour or two listening each night. Can't get enough! Crutchfield was a big help with the components. I hope more records will be recut and offered for sale. Hey guys ! Ex Radio / club dj! Got my set up at home Technics 1210, a bit modification made as changed wires inside, went for expensive once protected and it just (unplugged my ears) ! So basically I use mixer and monitors to play records! Still buy them and listen to my little son! Is great to see when my little boy is excited to put new record on turntable and press play button! Love watching him doing that ! I love my pioneer system which was purchased all second hand. The SX 939 and the PL 550 are pushing great sound through the CS 901's. New vinyl is preferred but old Louis Armstrong sounds just fine. Marantz 6100 paired with a Marantz 2220 receiver and Bose 901 Series IV. For headphones: Sota Comet with Music Hall PA2.2 and a custom Grado build (Turbulent Labs). Hi,I primarily listen to vinyl. I've been collecting records for many years, I currently have two thousand to twenty five hundred records. I usually only stream if I'm interested in buying something on vinyl. I don't care what anyone says vinyl ( analog) out performs digital in many ways. I buy new and used records and have many cd's as well but only listen to them for background music. Being a true audiophile I must say that I'm interested in hearing the music on quality gear first . The only way to do that is listening to vinyl records? Hello! My name is Jeff and I'm 62 years old and I've been listening to and collecting vinyl for at least 55 years, Most of my vinyl is rock and through the years I've ventured into Soul,Disco,Lightjazz,New age and currently I'm hooked on Ambient Space music. I might listen to something like KingsX or Saliva and follow it with Altus or Unusual Cosmic Process. 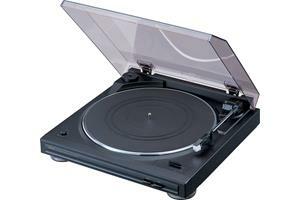 The new digital streaming format or cd is for sure more easy to throw on but I prefer a well conditioned vinyl Lp. I'm using a Nad C368 Hybrid Digital Amp, A Project carbon Turntable with Klipsch Reference RP-260 and a R-10SW subwoofer and the vinyl sounds incredible! One vinyl suggestion wood be Heart/Dog and Betterfly and crank it up! 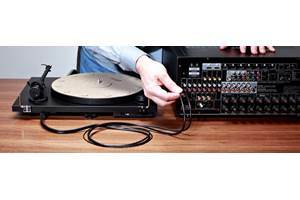 Hi Ruben Neria - Hope your refurbished receiver and speakers sound great, and whenever you're ready to purchase a new turntable, we'll be happy to help out! I belong to the era when vinyl records was pretty much all there was. I went through the 4-track/8-track/cassette tape/reel to reel tape/CD trends and still have most of them. I have a couple hundred vinyl albums and some 45s and play the albums fairly regularly. I have duplicated most of the vinyl with CDs where possible, and I do use those most often for convenience. But I still prefer vinyl. As far as the downloads go, I never have liked the idea of spending money for something intangible. I want the physical product with the glitzy covers, pics, and stories to hold in my hot little hands. I've never quit listening to vinyl. My current system is a Crutchfield scratch-and-dent and closeout paradise of a Music Hall MMF 2.2 turntable that I upgraded with an Ortofon Red cartridge and a cork mat, a Cambridge Audio 551P phone preamp, and a Marantz PM6004 integrated amp driving Polk RTI-A9 speakers (yes, that little amp can drive those monsters without breaking a sweat). I was not expecting great sound from that budget Music Hall turntable (obsolete but still available at a discount), but I've been blown away by how good it sounds now that the Ortofon has broken in, especially with some of the new 180g LPs. It tracks perfectly with little or no inner groove distortion, no audible rumble or motor noise, and stable speed. I'd put it up against turntables costing several times as much, where you very soon get into diminishing returns on price. I like it so much that I'll probably upgrade the Ortofon with the Blue stylus when it comes time for a replacement. i have 1500 records i play occasionally. all genres, but predominantly classic rock. pandora streaming for day to day listening. i always use a discwasher and anti-static gun when i spin them and they are cared for in bags unlimited plastic covers. i value the cover art as much if not more than the music. i always took care of my records and the ones from my youth are in the best condition. i play my vinyl on a vestax pro turntable with a sure cartridge, 130 watt onkyo home theater receiver, four yamaha towers, klipsch center and subwoofer, and an extra sub by cambridge audio. to top it off i have an actual drive-in speaker stand with two converted speakers hanging from it that sound pretty good (for rear surround in a 7.2 surround set-up for video). I just found myself reliving the past after taking my Yamaha CR -440 in for service and re-doing the surrounds on my Cerwin Vega D-3's. I'll probably buy a turntable from Crutchfield next since I'm longing to hear that warm depth of my old vinyl collection once again! I still remember ! Thanks for sharing, Bronson. You're probably among a small minority of folks who managed to avoid CDs, but you're definitely in an even smaller minority who proudly boast of still listening to their 8-tracks! Good luck, David. 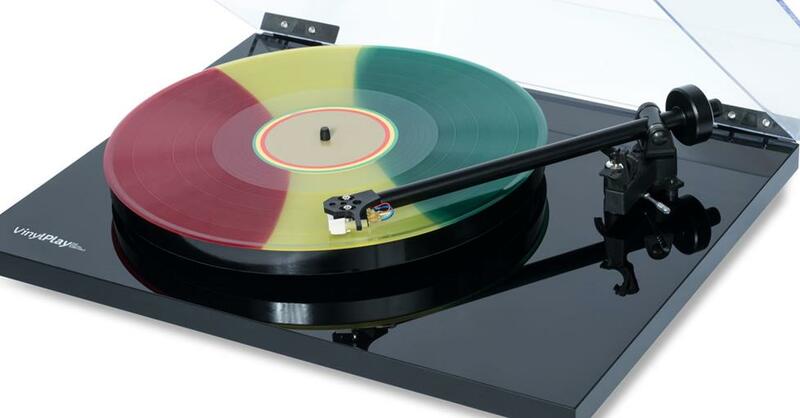 You'll find no shortage of articles and advice on the web on converting vinyl to CD. Thanks for sharing! Thanks for sharing, Kevin! Enjoy your streaming adventures ahead! I have been collecting records since the 70's and have enjoyed playing them over any other media type. I do use CD's for the car, and following a recent move I have upgraded some of my gear to include Polk Audio speakers and a Teac USB turntable. Although I still use my Marantz SR7000G receiver, I'm hoping to figure out how to burn CD's from some of my collection for listening during travel. That being said I guess I will always be a vinyl player. I listen on both a Dual 510 and a new Audio Technical LP-120. My amplifier is an old Akai AA-1050 and my speakers some low end Technics CR-77 that do need replacing, but only cost me $12 for the pair at Goodwill. The biggest pain with modern vinyl? Off center pressings! I'm very sensitive to pitch variations and on about 30% of my newer vinyl purchases I hear the WOW big time and you can see the headshell swinging left to right. Some recent vinyl purchases that left me disappointed after several returns: a-ha cast in steel (side b off center) trainspotting ost on orange vinyl, side 3 off center wild feathers, lonely is a lifetime, both sides off center, side b worse the best setup will never play these records as they deserve to be heard if the quality control at the pressing plants doesn't improve. I have had a record collection since I was 7 years old. I have both cd's and vinyl in my current collection. I listen to both. Each has its strengths and I get enjoyment from both mediums. Cd's are simple. Vinyl is a pain. Small changes can have a huge impact on the sound ( recently realized my VPI matt was adding a hum to my records- turntable vibration is the devil in the details). Won't take a side in this war! Just starting to experiment with streaming. Brave new world. These are some beautiful systems. Thanks to everyone for sharing and keep 'em coming! I have over 300 vinyl records and they all get played! My man cave is a misic lovers paradise! Currently spinning a Crosley C-100 with a LP carbon needle through a vintage Denon reciever and EQ hooked to (6) vintage Polk Audio speakers. I buy and spin!!! I buy new or used, depending on what I'm looking for. I play vinyl at home, and digital in the car. Gear- Philips GA212 with a Grado Prestige Blue, Marantz 1060 amp & 105B tuner. Pro-Ject phono box, Lil dot tube headphone amp, and Speakerlab 2's with a Speakerlab SW. I still play my vinyl from the 60's & 70's but thumb through used & reissued vinyl in the stores when I come across them looking for that one that "got away" in my youth. 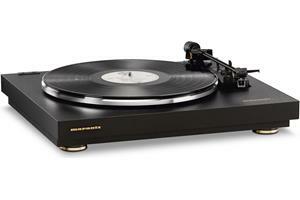 I use a refurbished Pioneer direct drive turntable through a refurbished Marantz 2245 Receiver. Have fresh (new) Polk Audio speakers for the end effect/ vintage speakers can be a real hit or miss issue. I was a DJ in Denver in the mid 70's. I have a large vinyl collection from those days, as well as some from the fifties and sixies I collected growning up. I learned from an early age the importants of taking care of my records. I have an old Thorens turntable, a NAD Amp and preamp just for listening to vinyls, everything else, (CDs, streaming, etc.) goes through my Denon AVR. My vinyls are for my listening plesaure only. I just bought a Pioneer PL-512 turntable, in excellent conditiion, with a nice Empire cartridge from the original owner on Craigslist for $50. A new belt and it works like new! It also came with the original box and manuals. I'm running that through a Pioneer TA-7800 tuner, and a Pioneer SA-7800 amp. My brother had them sitting in his attic and gave them to me when he moved to NC a couple of years ago. A good cleaning and a few shots of contact cleaner and they work great. The Speakers are Micro Acoustic 1s in very good condition that I got on eBay for $50. The guy only lived a couple of towns away from me. He wouldn't ship them, so I was the only bidder. All together, I've got about $150 invested in this system, and it sounds great! Awesome, Ken! Thanks for sharing! Hello, I play all my vinyl on my refurbished Thorens TD 145, a high school graduation present. I have a Grado Gold cartridge. I have a B&K amp, preamp and phono stage. For speakers I have The Snell D. My vinyl has never sounded so good! I have several turn tables but the main one is a vintage refurbed Marantz that I recently bought from a used record store. I buy both new and used records and the used records best be in tip top shape or NO buy! I have records I've owned for 40+ yrs and due to extreme caution and care they almost play and sound as good as the day I bought them...the ones I never loaned out that is! When I listen to my vinyl it's a serious issue. I sit down in the living room on the theater style couch which one of the seats a positioned to exact center between two speakers that are about 8 feet apart. I put on a record and listen intently to what ever I feel in the mood for from Deep Purple to Led Zeppelin or from Pink Floyd to Yes. If you want to listen to records with me I have one rule....LISTEN, NO talking! If you want to chat we can do that over AFTER the record is over! My set up is the Marantz turn table with a Philips era Marantz receiver with a pair of vintage H.H.Scott Bostonian IV's "Audiophile Series". "I could use a new cartridge by the way." 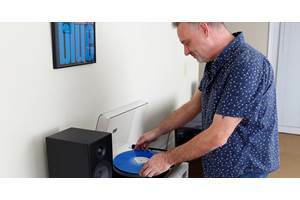 I am a vinyl aficionado just look at fb my profile. I run a used vintage vinyl shop. U-Turn Audio Orbit turntable with onboard pre-amp, Ortofon 2M Red cartridge, Denon MPA-50 desktop amp, Klipsch ebony RP-150M passive speakers, Audioquest Goldengate RCA cable.